Oft-time Cantab bartender, full-time Cantab poet John Pinkham. Photo by Christopher Clauss at Slam Free or Die. 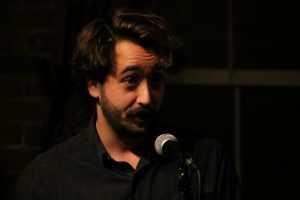 John Pinkham stumbled down the stairs of the Cantab Lounge on his way home from work in the summer of 2014, and despite the best efforts and advice of friends, organizers and the local community, he cannot find the way out. In the interim, John began writing, performing and competing with original work. He has showcased his work in Boston Poetry Slam’s Individual World Poetry Slam qualifier finals as well as their National Poetry Slam team selection finals. Drawing inspiration from his family’s Boston Italian roots, his poems can be paired with a large iced regular from Dunkin Donuts and a Pizzelle cookie. If you wish to book John Pinkham for features, special events or office Christmas parties, you may reach him by email at pinkhamjohn@gmail.com.